Sharing utilities are a relatively new development on the web, but that hasn't stopped services such as Addthis and Sharethis from garnering revenues off today's Internet market. Already essential and familiar components of the Web experience, these two services are compared here. 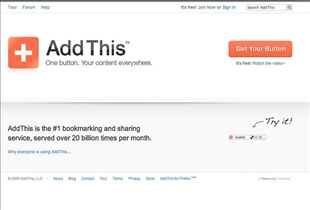 AddThis is a social bookmarking service that can be included in a website by way of a widget. With the use of the service, visitors to the site are able to bookmark items using any one of many services such as Facebook, MySpace, Google Bookmarks, and Twitter. AddThis is currently the most popular service of its kind. ShareThis is a similar widget-driven service that enables people to share content on the Internet by way of e-mail, AIM, or text messages. ShareThis also allows users to maintain accounts of personal contacts that they can also send to other users. Like AddThis, ShareThis is typically displayed as a button that can be placed on a site to drive traffic, stimulate viral activity, and track content sharing. 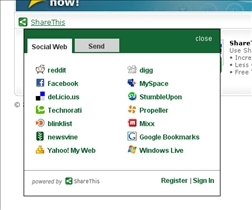 In addition, ShareThis is also available in toolbar versions for the most popular Web browsers. Customized widgets are also offers for the top blog publisher sites. While both services offer a great deal of customizable options, AddThis is somehow more appealing to use, since the “+” sign and recognizable icons for popular sharing services clearly show you what the button is for. The boomerang icon that ShareThis uses on the other hand can be quite confusing for first time users. AddThis is also a lot more simply laid out, although ShareThis does implement a useful categorization feature. In terms of if ease of use and easy navigation, at is just slightly ahead of ShareThis. AddThis is also a lot quicker to integrate into an existing website. ShareThis on the other hand may take a while before you can figure out the best way to implement it without adversely affecting the load times of your pages. The AddThis widget also automatically senses where the widget is in relation to the edge of the page. This means that the widget will open in whichever side of the button is best from a functional standpoint. ShareThis on the other hand requires you to specify the offsets for the left or the right of the widget. Both AddThis and ShareThis can stand some improvement with regard to reporting. While some submissions are immediately apparent, others aren't always so. In any case, both services are reasonably easy to implement, and only a few minutes is required for you to begin interacting with your readers. sharethis is harder to implement and i dont like the boomerang icon. But since it launched the "Stream" would that help webmasters get more traffic from other sites? Google Chrome vs. Firefox: Which is better?